DON'T RUN OUT OF STIGs. STOCK UP TODAY. 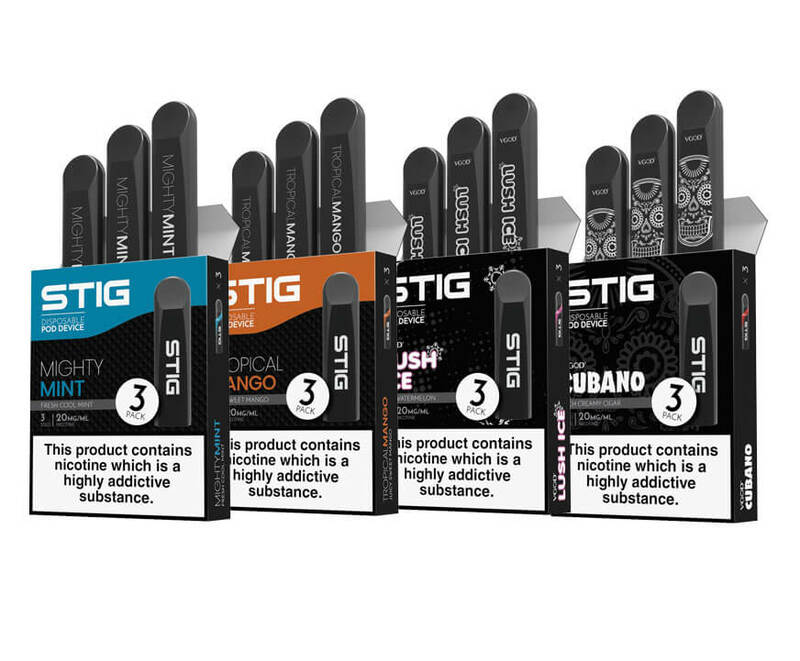 Each pack contains 3 STIG Pods. Each box contains 10 packs per flavor. You must order in incements of 10 packs per flavor. Minimum Order quantity is 40 total packs. Iced Mango Bomb SaltNic filled STIGS are an instant classic for fruit and menthol lovers everywhere. It is an exhilarating taste of the freshest slices of juicy mango with a cooling menthol finish. Iced Mango Bomb SaltNic STIGS are 6% nicotine by volume. One STIG equates to approximately 20 cigarettes. There are three STIGS inside one pack, ten packs in one box and 20 boxes in one case. Mighty Mint by SaltNic is a Refreshing Cool Mint Providing the perfect amount of Menthol for an irresistible all day vape! Try a Pod Today! LushIce by VGOD® is a Delicious Burst of Fresh Watermelon on the Inhale with sweet undertones of Mixed Melons and smooth Menthol on the Exhale, providing a Smooth and Fruity All-Day Vaping Experience! 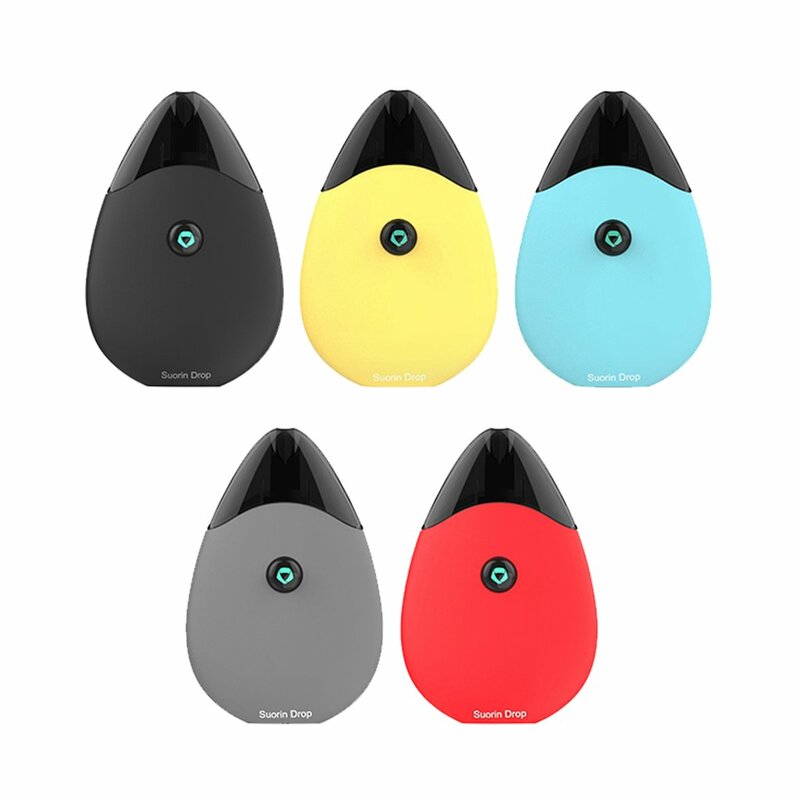 CliC is an ultra portable pod system that delivers all day satisfaction and great vapor production with open airflow. The battery is slim and constructed of an anodized aluminum shell. At 350maH, the battery capacity is quite substantial and will last all day. The Clic utilizes advanced smart temperature control technology for user safety. Rechargeable device and USB charger is included in the package. Meant to be used with Clic non-refillable pods (not included with the device). 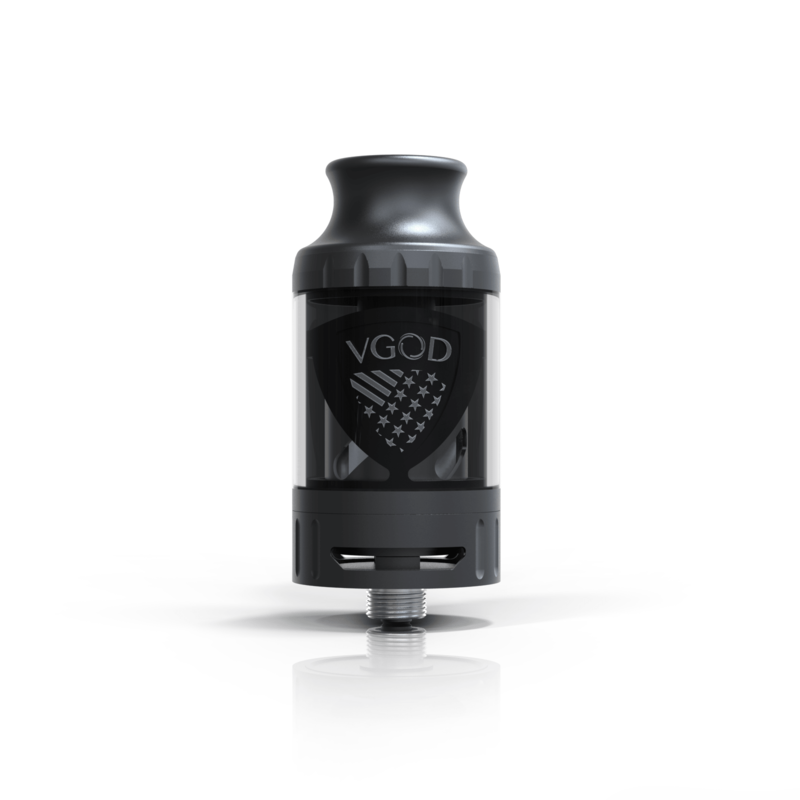 After much research and testing, VGOD Engineers have devised the Pro Sub-Tank to be the most minimalistic yet multifaceted sub-tank any vaper will ever need. 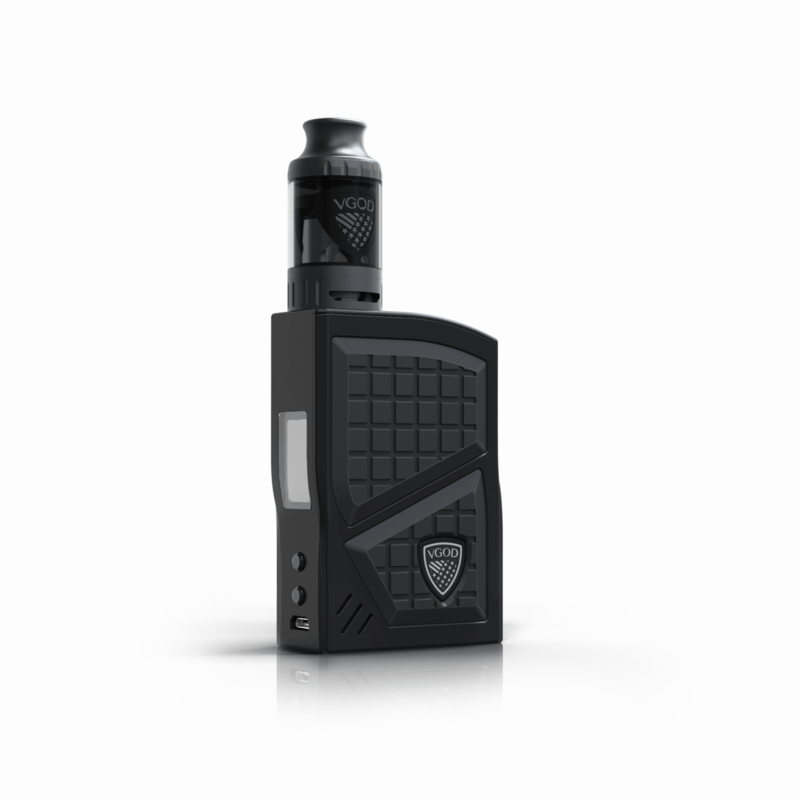 Pro 200 Box Mod Kit features a zinc alloy with black powder coating construction. Built for style, power and durability. Pro 200 accommodates multiple vaping styles with multiple advanced settings and diversified function that incorporates four modes including Wattage Mode, Mech Mode, Pro Mode and Temp Control. 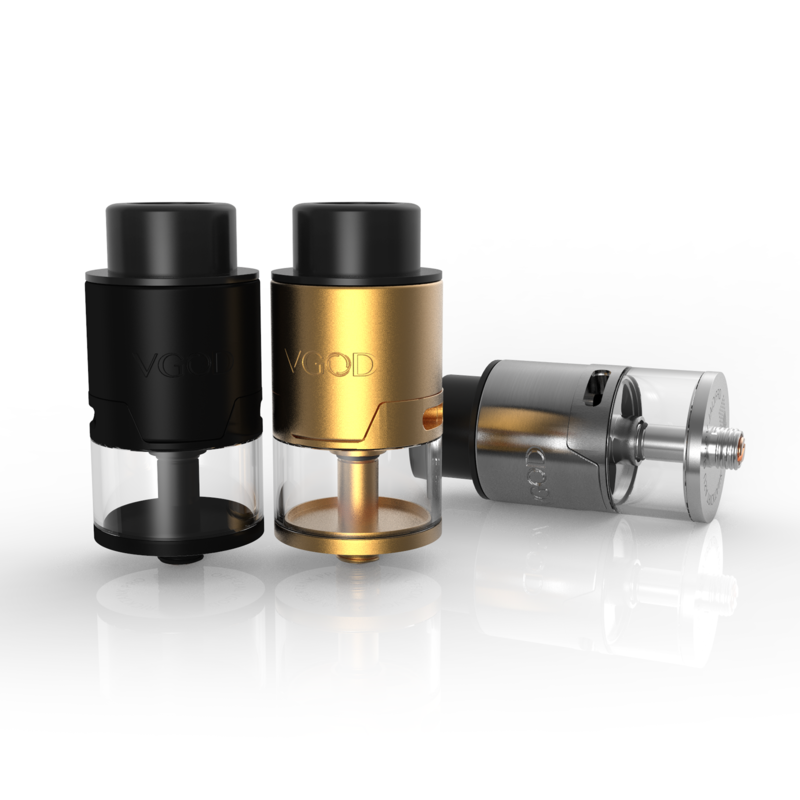 Kit includes VGOD Elite RDTA available in stainless steel or black, one 0.2Ω Shotgun coil, and a replacement glass. Necessitates dual 18650 batteries, supports quick USB charging. has several safety features and is firmware upgradable. ORDER THE CAMO SERIES NOW! The World's #1 Mechanical Mod "Pro Mech" Has Evolved and is here! 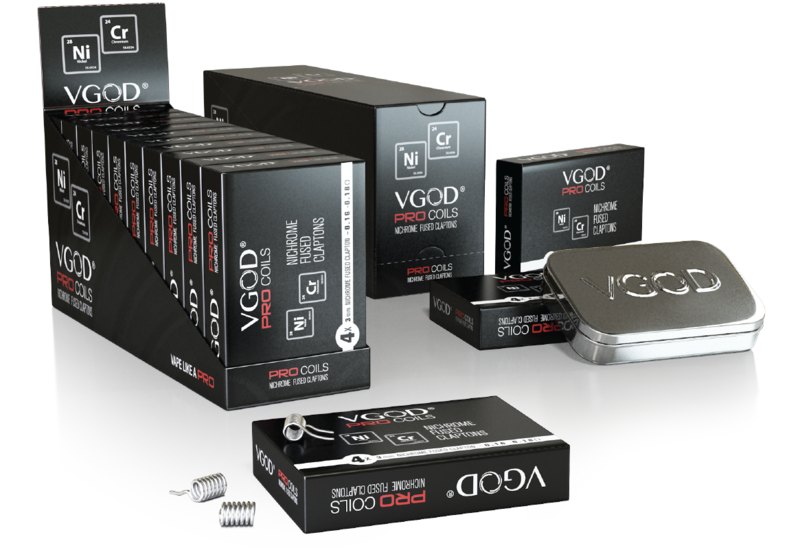 VGOD Fans have been waiting for The Pro Mech 2 Kit in these new exciting colors. Be one of the first stores to carry it today! 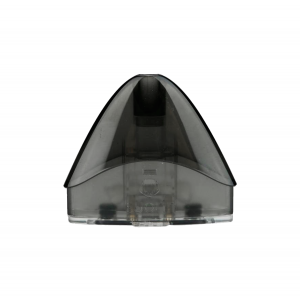 Refillable pod for the Suorin Air holds 2.0ml of e-juice and has a 0.5ohm coil. 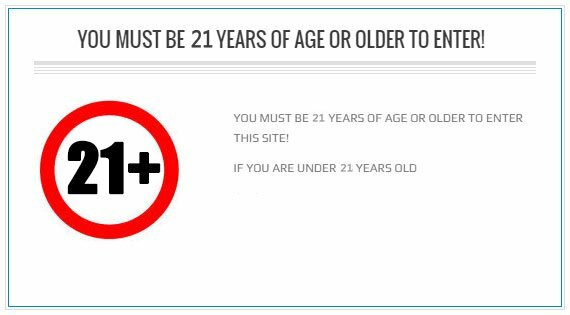 These pods come in boxes of 20, please order in increments of 20. 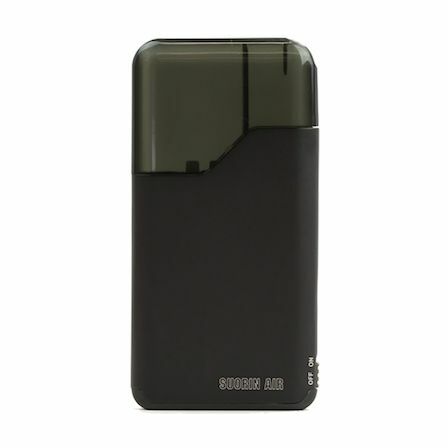 The Suorin Air (Latest Version) Refillable Pod System is the first of its kind offering compact card like design and powered with enough low wattage to give you a consistent satisfying vaping experience. Featuring: 400mAh battery, 16w device, battery indicator, light weight aluminum housing, micro usb charing, 2.0ml refillable pod. 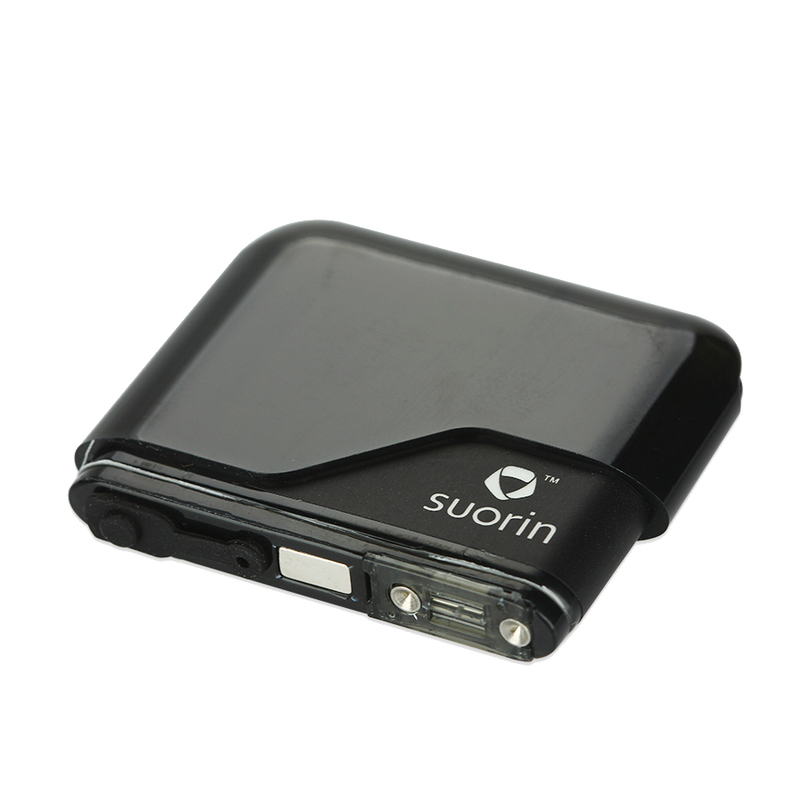 This is a refillable cartridge designed for use with the Suorin Drop Refillable Pod System. These 0.5 ohm pods are easy to refill and hold 2ml of your favorite e-liquid and have magnetic attachment point. Where function meets Form; Elegance, Style, Comfort. 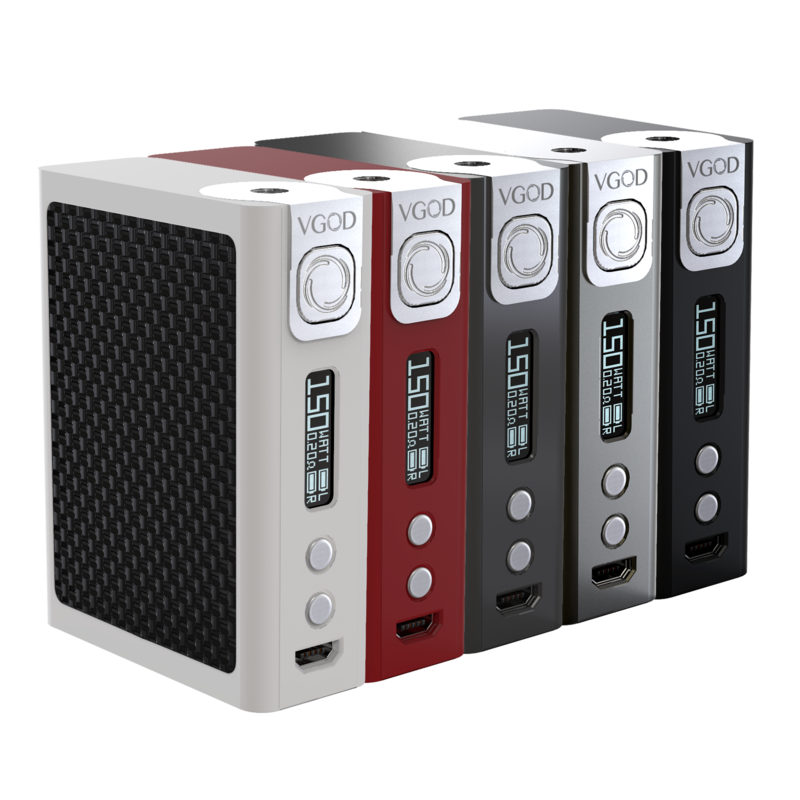 VGOD® PRO150 BOX MOD is the hight of modern luxury. Featuring carbon fiber material, stainless steel construction, temperature control, dual 18650 battery bay, fast micro-USB carging, and supporting Ni, Ti, Kanthal, or Stainless Steel coils. 2 x 3mm Wrap, Fuzed Clapton Coils, 0.16 - 0.18ohm. Dual 26ga core wrapped with 40ga. All wires are Nichrome 80 for quick ramp up time and a clean tasting vape experience. Included in the custom VGOD tin are four coils and perfectly cut Organic Japanese Cotton. 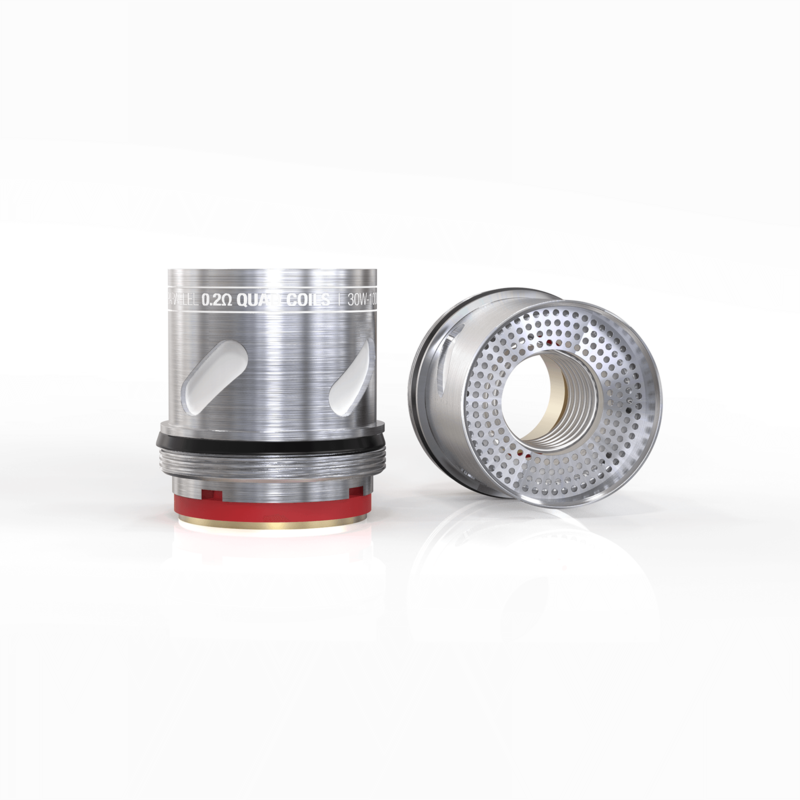 Four hole deck style; Direct bottom airflow; Stainless Steel construction; deep well; 24mm diameter, 32mm height. 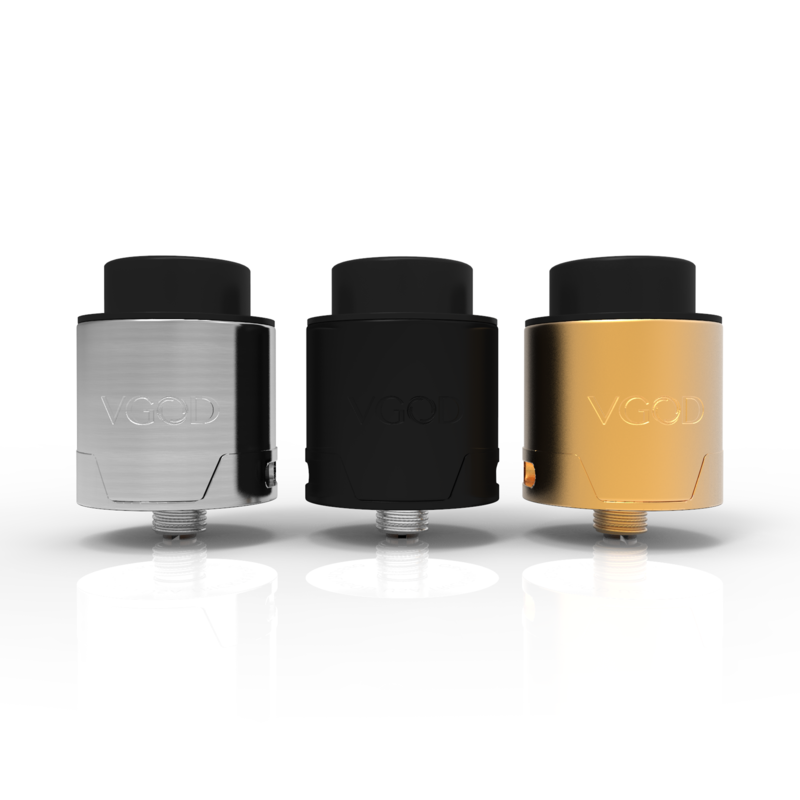 VGOD® PRO Mech Mod features a 24mm diameter, Billet Copper Construction, Aerospace Grade Carbon Fiber Encrusted Button, Deep Engraved logo, Hybrid 510 connection, self adjusting gold plated battery button! *Silver mod has an aluminum body instead of Copper. 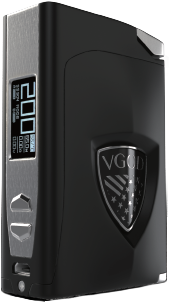 VGOD® Tricktank Pro RII - Bred by competition. Built and designed by professionals, for professionals. Featuring a pressure tank system with 4ml capacity; Four hole velocity style deck/post; revolutionary side fill design; direct bottom draw air flow; gold plated center post and contact! Measuring in at 24mm diameter. Prominently featuring its emboldened VGOD Flag Crest design, the Elite Mech Mod, by VGOD, offers unparalleled presence and style that is only matched by its performance and durability. The elegantly designed mechanical mod features a "flare grip" chassis with hard hitting copper construction. A 510 hybrid connection, copper contact, along with a copper framed aerospace grade carbon fiber switch, ensures you get the maximum voltage performance and look good while doing it.